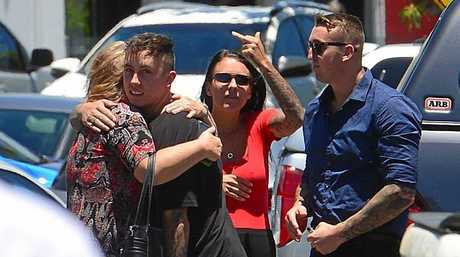 Brae Aidan Furlong (right, in dark blue shirt) speaks with supporters after being sentenced in Maroochydore Magistrates Court for assault occasioning bodily harm while adversely affected by an intoxicating substance. PLASTERER Brae Aidan Furlong's single drunken punch laid out an Ocean Street reveller, leaving him with bleeding on the brain. 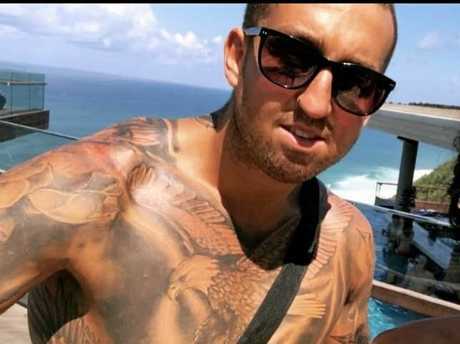 Magistrate Chris Callaghan referred to the One Punch Can Kill public safety campaign when sentencing Furlong on Thursday, telling him he could have easily killed the 32-year-old victim who was hospitalised for two days after the punch. 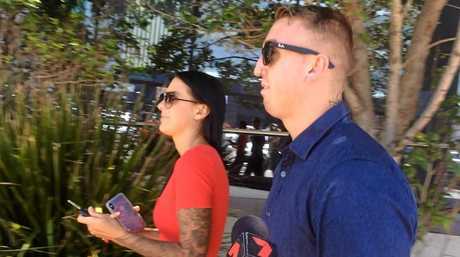 Furlong, 23, walked free from Maroochydore Magistrates Court after pleading guilty to assault occasioning bodily harm while adversely affected by an intoxicating substance. 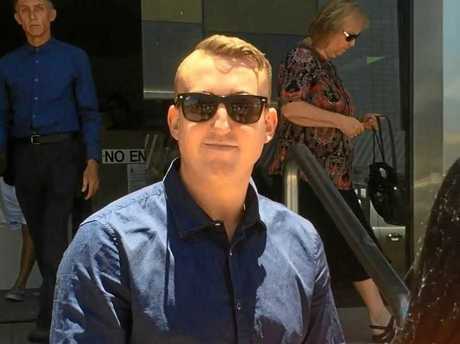 The court was played footage of the July 15 attack, which happened outside Peak Wine Bar in Maroochydore's safe night out precinct. CCTV attack: CCTV footage of Brae Aidan Furlong delivering a vicious punch at Ocean St, Maroochydore. Defence lawyer Anna Smith said her client, his partner and the victim had been asked to leave the venue earlier in the night. Ms Smith said an argument had started inside after the victim had tried to get into a unisex toilet while Furlong's partner was in there. She said the partner had perceived the victim making disparaging comments or movements later in the night and told Furlong about it. "Mr Furlong then points at the complainant, says something and then punches him," Ms Smith said. Police prosecutor Senior Constable Amanda Brewer said the victim was taken to Sunshine Coast University Hospital for treatment of a bleed to the brain. He also needed stitches for cuts to the inside of his mouth. She said scans showed after 24 hours the size of the bleed had increased but fortunately the victim did not require surgery. "In my submission it is an unprovoked event," Snr Const Brewer said. 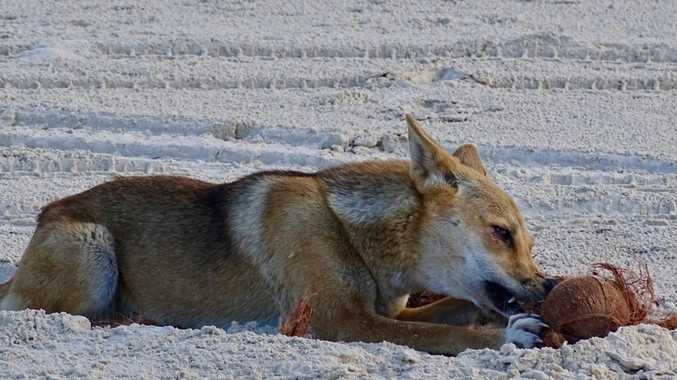 "It is quite confronting to see the way the victim impacts the ground." She asked that Furlong be sentenced to 18 months in jail, to serve six months. Ms Smith submitted letters from Furlong's cousin, Red Frogs Sunshine Coast coordinator Dan Terry, as well as his boss Sebastian Garski. She submitted sentencing options with no actual jail time were appropriate. "He accepts that he did drink too much that evening," Ms Smith said. She said he hadn't been out to hotels or bars since. Furlong also wrote a letter detailing his extreme remorse. Mr Terry's letter said the assault was out of character for his cousin. Mr Garski's letter detailed a change in attitude he had noticed in his employee since the attack. He also said Furlong was a valuable worker. Mr Callaghan noted Furlong had no criminal history and accepted he was otherwise of good character. After hearing the evidence he adjourned the court for a little more than half an hour before coming back in to deliver his sentence. "You are totally to blame for the offence," Mr Callaghan told Furlong. He called it gratuitous, unprovoked violence. "It is a prevalent offence. "People do die from assaults such as this." He sentenced Furlong to nine months in jail, to be suspended immediately for a period of three years. Furlong was also ordered to perform 240 hours of community service and to pay $2000 compensation to the victim. Furlong hugged supporters in the courtroom. He declined to answer questions from reporters when he left the court house.